New Set-up: $80.00 (v); Repeat Set-Up: $50.00 (v); Running: $0.50 (v); Oxidation: $0.50 (v) . New Set-up: $80.00 (v); Repeat Set-Up: $50.00 (v); Running: Please provide logo to figure out cost. Oxidation: $0.50 (v) . Oxidation on lasered, electroplate surface to a dark charcoal color. $0.25 (v) will be charged per piece. Color-fill can be applied to the Satin Gold, Satin Chrome, and Nickel Platinum pens. $0.50 (v) for full wrap around. 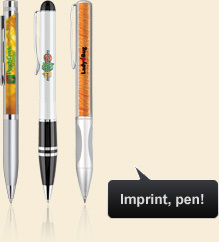 Screened logo imprint on any surface. $40.00 (v) setup charge on new orders per color/position. $25.00 (v) for repeat setup per color/position. $0.20 (v) running charge for additional color/position on metal/wooden pens, $0.10 (A) for plastic pens. PMS chart is based on white background, can't be guaranteed on colored surfaces. A product proof is recommended. Metallic foil stamping on metal pen surface. $40.00 (v) for new/repeat setup per color/position on pen and box. $0.25 (v) running charge per color/position on pen. $0.40 (v) running charge per color/position on box. Minimum order: 250 pieces.